This is the story of a time when people used to abandon infants in jungles. Of course, people still send children to prep schools, but this is not about that. This is about the life of young man who wanted to be like Tarzan. He almost got there, too. Just that instead of ending up with Jane he got hooked on to the baby elephant. 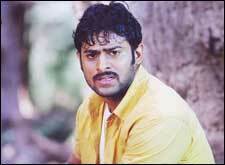 Ramudu (little Prabhas) is a spirited kid who likes to play with the daughter of his village's benefactor, a rich MP. The girl's uncle, however, kicks away the kid saying that he better stay away from high-class people. Ramudu is deeply hurt. If only Ramudu knew that the evil uncle was doing this for his own good. You wouldn't want to be near that girl after seeing what she grows up into. But kids will be kids. Little Ramudu and the girl still play on. At least that's what we think they're doing behind the bushes. So starts the love story. The girl even teaches Ramudu how to read. One day, the girl returns to the city. After a decade or so when Ramudu has to go to the city for further studies, he takes his love for that girl bundled in his big heart. Little does he know that however big his heart might be, nobody can hold the size of love enough for Aarti Agarwal. Ramudu doesn't know that Aarti was the girl he used to steal all those fruits for when he was young. He would've felt really awful if he knew how all that contributed to her growth. Anyway, he doesn't weigh his options (heh heh), and continues to tell her how he loves his childhood friend. Meanwhile, in the college, Ramudu becomes Mr. Popular. Anybody who wears a python around his neck, plays the guitar and dances half-naked crazy in the college, would, we suppose. Now it so happens that as soon as Ramudu gets to know that Aarti is his childhood love, her evil uncle takes her away. Ramudu also doesn't pursue the matter further thinking that he might not be able to feed a millionaire's daughter. Millionaire's daughter or not, he will not be able to feed anybody that size. So he dejectedly heads back to the village, when something changes his mind - an item number by Ramya Krishna. Now he happily heads back to the village. Just then Aarti and the gang of thugs also stop at the same dhaba. Now, what sort of a freak coincidence is that? Actually, that's no coincidence - that's the power of Ramya. Anyway, after seeing Aarti, Ramudu decides to stop being a pain and starts inflicting pain. He cleans up the thugs and takes-off with Aarti. They hide in a small boat on the banks of Godavari. In the morning, they find themselves in Mauritius. But after a song, I think even the director realizes what a howler he's made of himself. How can anyone who gets into a river in AP end up in Mauritius? That's ridiculous. So he makes the villains reach that place by walking through a jungle in AP. After a brief episode in the forest involving a cheap comedy track, the climax is shot in the tribal village of the hero. It has some really good stunts and effects. In the end, everybody's happy: heroine's mom and dad to get that feeding machine off their home, and the hero because he really likes elephants. Adavi Ramudu is so stale that you'll feel like a flea market if you stay there long enough. Prabhas looks and acts weird. And Aarti, we've already talked a lot about that mass of flesh. The songs might sound good to people living in jungles. The only things going for the movie are the stunts. Adavi Ramudu will do no good to Prabhas' career. Like Andhrawala after Simhadri, this one wipes away all the work he's done in Varsham. On the whole, this Adavi Ramudu feels like dead, decaying matter. It also looks like it. fullhyd.com has 700,000+ monthly visits. Tell Hyderabad what you feel about Adavi Ramudu!